Last week my friend and fellow tea blogger Mike (The Tea Letter) and I met for a gongfu tea session. Mike brought the tea, I brought the teaware and my camera. We had had tea together before at a tea house in San Francisco but this was the first time we got together with the intention to work on a “tandem” blog post. I’m glad to report that the input and inspiration I got from our tea session stretches far beyond that. 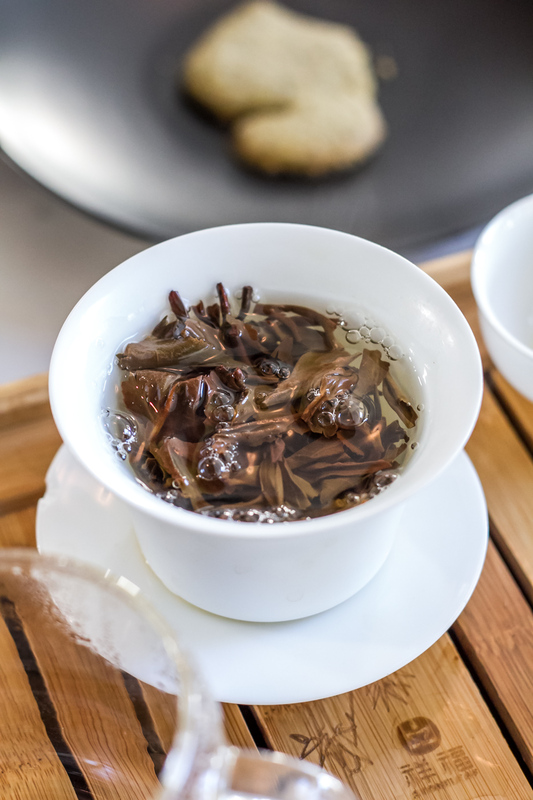 This post has been particularly challenging to write, maybe because that input stirred inward reflection and assessment of my own tea journey so far. Drinking tea together was fun and we had the chance to do what I call “detective work”. Mike brought a black tea from Yunnan he had limited information about, but he had been told that during processing there had been a yellowing stage similar to the one yellow tea undergoes. This was fascinating and reminded me to never take anything for granted when it comes to tea. Question everything. As for the information available on tea, you can never know how trustworthy that is and how much of it is pure marketing. I know, I might have become a little cynical with respect to the claims made in the tea world. Double, triple and cross check, if you can. At the same time, though, it’s okay not to have all the answers! Remember, the journey is much more important than the destination! And the technicalities should never impair our ability to enjoy tea. 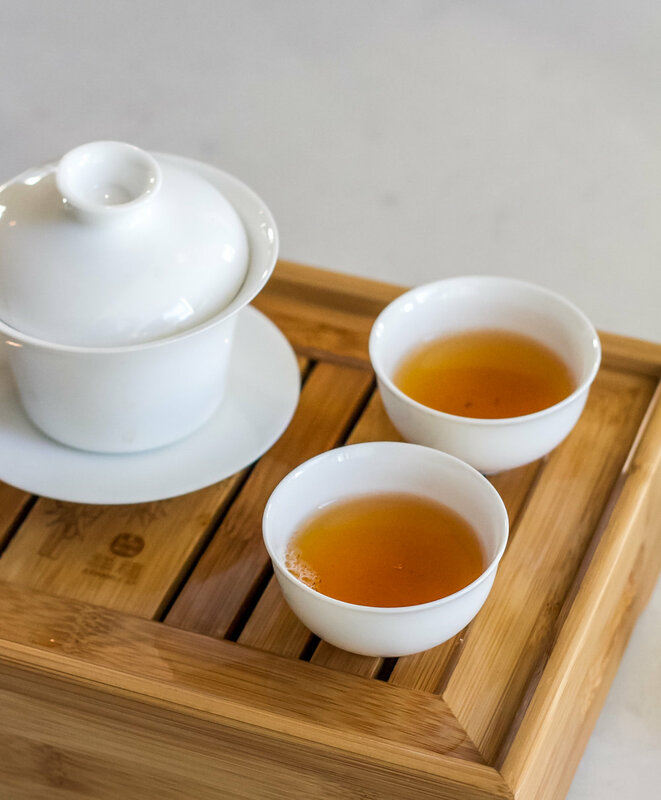 As odd as it might sound, drinking tea means practicing the art of active listening, something which doesn’t seem to be trendy anymore. Listening to yourself, your senses and your instincts and listening to whom you are having tea with. It’s about empathy. It’s about kinship. It’s about finding affinity to the tea and to your fellow tea drinkers. Find out what works for you and what makes you happy. Find your comfort zone with tea and push yourself out of that comfort zone from time to time, a little experimenting never hurts! The first two steeps of our tea were good but for me it lacked a little something. The third steep made me happy but made Mike uncomfortable. The reason? Astringency and bitter notes that reminded me of delicious black licorice candy and other pleasant things and reminded Mike of gasoline and unpleasant things. Our water was way below boiling point, so we were not running the risk of scorching the leaves. We dialed back infusion time and found a nice middle ground. The fascinating thing is, there’s no right or wrong way to do it. Ultimately, the experience has to work for you. And if pushing yourself out of your comfort zone is something you are willing to try, you can retrain your palate and sensory memory to appreciate flavor and aroma notes you don’t usually enjoy. This past year, tea has helped me preserve my mental sanity (I’m saying this half-jokingly) and has served many purposes beyond the pleasure of drinking it, including making friends. I’ve learned that having tea in common is not enough, but it’s enough to start (like an icebreaker) and I’ve discovered friends where I had not expected to find them. I’ve learned that it takes courage to express yourself, to make your own rules. Not everyone will like you but that’s okay, and that’s exactly what you should aim for if you want to find your “tribe” of like-minded tea people. What has been the main takeaway for you this year, dear tea friends? Let me know in the comments! Read Mike's post about our tea tasting here.